Shi Yanqiu is the Secretary-General of the China Container Industry Association. An accredited senior engineer, Shi graduated from the Dailan Industrial Machinery Department with a degree in Machine Production and Equipment. Shi has worked in the field of containerization for over 30 years, notably at the National Materials Department Container Company where she engaged in design, production management and standardization of shipping containers. During that time she served as an engineer and then senior engineer in various departments before becoming Director of the Management Office, Director of the Production Technology Office, and Executive Director of the Shipping Centre. Shi is a member of the National Container Standardization Commission, a member of the China Transportation and Shipping Association Advisory Board, and Chairman of the China Joint Industry and Economic Association. Shi has worked with various container enterprises to compile and implement twenty important industry standards, notably the JH/TC01 2000 Interchangeable Steel Container Joints Standard. 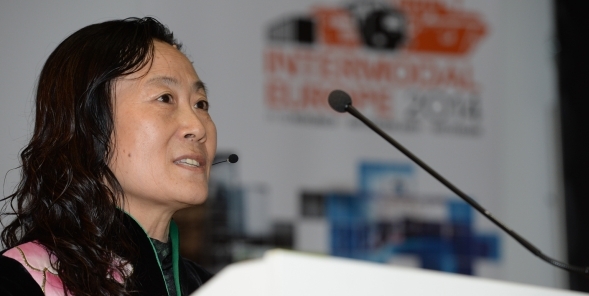 In 2003, she served as Chief Editor of the first Compendium of Chinese Shipping Containers, and as Editor-in-Chief for over thirty editions of the China Container Industry Association Newsletter. She also created and organized the China Container Industry Association Website, the first of its kind, filling in many blanks in terms of industry information, and gaining acclaim from within and outside the industry. Container to change the world Container of this seemingly simple invention to the rest of the world’s goods is transported to the destination in past 50 years. Container with safe, fast, efficient mode of transport changed between country and country transportation demand, to some extent, it changes global trade, change the world. At present the world container quantity already amounted to about 36000000 TEU. China container industry in the world economy and the modernization of transport logistics plays an indispensable role: China container industry has established four worlds first. By the world trade and economic growth and the industry of China container joint efforts of colleagues, China container industry has established four of the world's first. A. Container throughput B. Container specifications and Varieties C. Quantity of production and sales Since 1993 to 2011 world container production and sales volume of 38675000 TEU, while the Chinese production of container sales of 32550300 TEU, occupy world container production and sales in the 84.2%, At present been total world production and sales of 96%, products throughout nearly 100 countries and regions. China International Marine Containers (Group) Ltd (CIMC) has become the world's largest logistics equipment -- container manufacturers; Singamas Container Holdings Limited, China Xinhua Chang Group,and several container manufacturing group, and some supporting enterprises for international container market to make positive efforts. D. Container port throughput first in the world: in 2010 the world's 100 largest container port throughput of Container Port Throughput Accounting for 33.5% of China. In 2010 China Shanghai port exceeds Singapore port became the global cargo and container throughput first. China container industry in the world economy, international trade and logistics transportation plays a very important role. In 2013 Slow recovery economic container trade From World Trade Organization: 2012 world trade volume growth was only 3.7%, 2013 will be difficult to have high speed growth. China economy slowdown, steady growth China economy in recent 10 years has been to keeping more than 9% growth, has become the second largest economy in the world, the biggest manufacturing country, in 2011 China's import and export trade amount 3.642 trillion dollar ranks second in the world, has for three consecutive years to become the world trade in goods largest exporter and second largest importing country. In 2012 China's GDP increase will be adjusted to 7.5%. 5. 2013 Container shipping market will slow growth and more competition, the Transport capacity excess and other problems still exist End of 2012 June the global container ship transportation capacity has more than 16000000 TEU, in 2012 global container ship transportation capacity increase of 1280000 TEU growth of 8.3%. Alphaliner in the latest issue of weekly said that, end of November 5th; the idle container shipping is 762000 TEU, 4.7% of total capacity. The world trade volume growth will slow in 2013 According to the world trade organization to forecast, in 2012 world trade volume is expected to rise only 3.7%, and the 2011 world trade growth of 5%, in 2013 growth is expected to 4.5%. According to my personal opinion China's container port throughput and container production and sales will be steady growth in 2013. . The Container industry development direction in the future To improve the earth's environment, promote the development of ecological civilization, Energy saving and environmental protection, low-carbon. The light products, intelligent products, standardized products, information-based product. The development of sea railway combined transport, multimodal transport. China container industry associations play an active role, more social responsibility, promote the modernization logistics development, promote the container industry healthy and sustainable development. On behalf of the industry, to assist national departments to formulate industry policies and published opinions of members. Already established national and industry standards more than 20 play a positive role to regulate the industry production. Hold exhibition, Information exchange, Publish industry statistics report. China Container Industry Association (CCIA), located in Beijing and established in 1993 with the approval from the Ministry of Civil Affairs of the People’s Republic of China, is a nationwide social organization with legal person qualification. ●To provide reference, suggestions and proposals for the governmental departments concerned when making polices. CCIA adopts the system of both organizational membership and individual membership. At present, CCIA has 88 members including some international famous groups such as China Ocean Shipping Company (COSCO), the largest container manufactures in the world such as China International Marine Containers (Group) Ltd. (CIMC) and the authority organization for certification and management of freight containers in China such as China Classification Society (CCS) as well as numbers of enterprises and entities of container manufactures, suppliers of material and components, research institutes, inspection bodies, repairing works and administration departments and etc. Among those above more than 95% of the members are container manufactures and suppliers of material and components. China’s container manufacturing industry is now playing an important role in the international trade and continues to hold the position of first-place in the field of manufacturing and selling containers for 13 years in succession, occupying more than 95% in the international container markets. In 2005, 2,048,000 Units were exported, earning 5.9 billion US dollars. In recent years, novel types of containers have been developed rapidly, which includes more than 300 types of three series such as: ISO standard general purpose containers, special purpose containers and Non-ISO standard containers, and other series of products like semi-trailers and etc. The above –mentioned products are in possession of numbers of intellectual property and are also able to meet the all kinds of needs for transportation of general and special cargoes.